BOSTON, Nov. 22, 2010 /PRNewswire/ -- Over 60 percent of men would opt to toast with beer versus champagne, if given the choice. Thanks to Infinium ™, a crisp, new champagne-like beer that sets a new standard in brewing, men now have the ultimate drink with which to celebrate this holiday season. Debuting in early December, the premiere sparkling brew is the culmination of a two-year collaboration between Jim Koch, brewer and founder of Samuel Adams beers, and Dr. Josef Schradler, managing director of Germany's Weihenstephan Brewery. The first new beer style created under the Reinheitsgebot in over a hundred years, Infinium unites 1,000 years of combined brewing knowledge and innovation between the two breweries. Available for a limited time only, this innovative new beer style adheres to the rigorous standards of the Reinheitsgebot, the historic German beer purity law that states all beer must be brewed using only four ingredients: malt, hops, water and yeast. Infinium pours out a deep golden color with fine bubbles and has a fruity, elegant aroma. Its crisp acidity gives it a dryness and tartness on the palate that is balanced with a smooth malt body. Infinium is packaged in 750mL cork-finished bottles and contains 10.3 percent alcohol by volume, twice the amount of an average beer. This crisp, vivacious brew is certain to make a palate-pleasing gift for food and beer connoisseurs and as a recent survey found, men are eager to celebrate with beer throughout the holiday season. Infinium 's light, sparkling character is a welcome complement to all festivities, allowing drinkers to enjoy the best of both worlds. 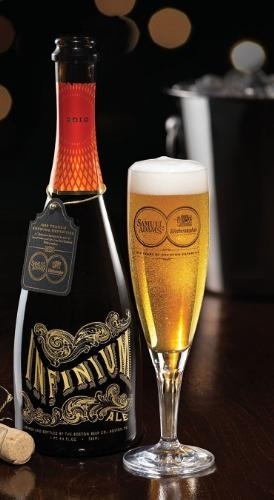 "Dr. Schradler and I are thrilled to uncork Infinium, and introduce not only a first-class beer, but a new standard in the art of brewing," said Jim Koch, Samuel Adams founder and brewer. "When I brewed the first batch of Samuel Adams Boston Lager in my kitchen in 1984, it challenged America's perception of what beer could be. At the time, beer drinkers weren't used to bigger, more flavorful brews that used high-quality, traditional ingredients and followed the age-old Reinheitsgebot purity law. Infinium continues to challenge people's perception of beer in a very different way, making this partnership unique. I've had the opportunity to work with some of the most talented brewers in the world during this project, and we're all excited to finally share Infinium with drinkers this holiday season." Both breweries share great passion for the art and science of brewing, and pride themselves on using only the highest quality ingredients to produce award-winning, world-class beers. Weihenstephan was founded by Benedictine monks in 1040, and is the guardian of the original Reinheitsgebot law. Every batch of Weihenstephan's beer is evaluated by a panel of experts for color, aroma, froth consistency and flavor. "It was exciting to work with Jim and the brewers at Samuel Adams to stretch the limits of Reinheitsgebot during the creation of Infinium," says Dr. Josef Schradler. "This beer is truly a marriage of the German brewing heritage that our brewery has upheld for almost a thousand years, combined with new, innovative brewing techniques that take beer beyond what anyone expected to be possible under the constraints of the purity law." Not only is Weihenstephan the oldest brewery in the world, it has upheld a tradition of being a center for research about brewing and brewing technology for hundreds of years. The Weihenstephan Science Center of the Technical University of Munich is one of the highest regarded brewing schools in the world, and was instrumental in the development and creation of Infinium with the Weihenstephan and Samuel Adams brewers. Available at select locations worldwide for a limited time, Infinium , hits shelves in early December, for a suggested retail price of $19.99 per 750mL bottle. *Survey conducted by Wakefield Research, an independent research provider. Demographic quotas were set to ensure that results are nationally representative of the survey audience. Results have a margin of error of 4.03%. Today, the Company brews more than 31 styles of beer. The Company uses the traditional four vessel brewing process and often takes extra steps like dry-hopping and a secondary fermentation known as krausening. It passionately pursues the development of new styles and the perfection of its classic beers by constantly searching for the world's finest ingredients. While resurrecting traditional brewing methods, the Company has earned a reputation as a pioneer in another revolution, the "extreme beer" movement, where it seeks to challenge drinkers' perceptions of what beer can be. The Boston Beer Company strives to elevate the image of American craft beer by entering festivals and competitions the world over, and in the past five years it has won more awards in international beer competitions than any other brewery in the world. The Company remains independent, and brewing quality beer remains its single focus. WhileSamuel Adams brand is the country's largest-selling craft beer, it accounts for just under one percent of the U.S. beer market. For more information, please visit www.samueladams.com. The Bavarian State Brewery Weihenstephan. Nearly one thousand years ago it was the monastery brewery of the Benedictine monks, then the Royal Bavarian State Brewery. Today, as a regulated enterprise of the Freestate of Bavaria, it is a company run according to the precepts of private business. As the oldest existing brewery in the world, the brewery occupies an exalted site atop Weihenstephan Hill in the Bavarian city of Freising, surrounded by the comparatively still very young Weihenstephan science centre of the Technical University of Munich. Yet it is precisely this unique combination of tradition and custom, proven knowledge, and modern science, which gives the brewery its incomparable identity and permits it to brew beers of the highest quality. www.weihenstephaner.de.